Give a kid a spot to play and explore his or her imagination with this 2-N-1 Activity Table. 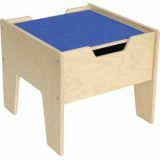 The activity table features a double-sided wooden board with a 15” x 15” Yellow LEGO® compatible baseplate on one side and a racetrack on the other. Hidden underneath the removable board is a generously sized storage space making for quick clean up. Constructed from 100% Baltic Birch plywood with eased edges and coated with our exclusive Tuff-Gloss UV Finish making it resistant to stains and durable for any classroom or home settings. The mortise & secure fasteners provide exceptional strength and durability. Pass down this table throughout the generations with our Lifetime warranty. This product is GREENGUARD® Gold certified. Dimensions: 16"H x 18-5/8"W x 17-5/8"D.The storage dimensions are 6”H x 18”W x 17”. The 2-N-1 Activity Table comes fully assembled. This product does not include LEGO® blocks. Now completely renovated, with new elements and new design. Every young engineer can build objects from thereal world. 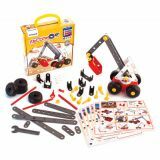 The set is made of durable plastic and includes a spanner, screws, pulleys, nuts, etc. Various designs are included. 8 large size cards included. Detailed examples of constructionwith progressive stages, helping thechild's attention and reasoning. Tobegin making more complex assembliesdeveloping creativity. Improved component design and better quality materials! Extremely easy to thread! With progressive difficulty modelcards to create different models. Now completely renovated, with new elements and new design. Every young engineer can build objects from the real world. 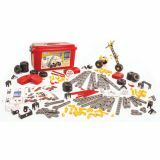 The set is made of durable plastic and includes a spanner, screws, pulleys, nuts, etc. To encourage children´s abilities, 6 large sheets detailing the construction of various designs are included. 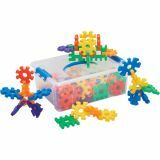 This marble construction set is perfect for your budding engineer! 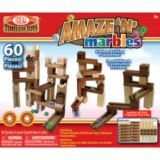 Made of sturdy wood, this 60 piece set includes all kids need to create endless combinations of marble mazes! The solid hardwood blocks feature grooves and holes for constructing loads of different tunnels and chutes! 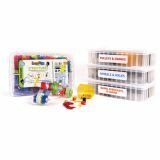 Amaze-N-Marbles is perfect for helping kids develop basic learning, organizational, visualization, and coordination skills! This classic hands-on toy will entertain kids for hours, parents may even want to join in on the fun! Perfect for rainy days, play dates, and more! This toy includes marbles and is designed for kids ages 5 and up! The Brackitz Bugz Playpark has 47 pieces including a motorized vibrating bug and directions for building over 20 play parks and obstacles. Race your motorized bug through crazy obstacles like the Toppling Tower, Super Spinner or make your own. Every race and playpark combination is different - The possibilities are endless. No helmet required. All Brackitz sets work together for mix-n-match play! This is the BIG ONE! It gives you Structures, Pulleys & Cranks, Wheels & Axles, and Gears, Sprockets, & Chains all in one. It's ideal for library makerspaces and creative spaces in classrooms. It's big enough to share across classrooms and it's a BIG launching pad for special challenges and schoolwide design/build projects and contests.